Florida's known for a pretty wide range of things: oranges, sunshine, retirees, Disney World and, not least of all, the near daily deluge of bizarre and often entertaining "Florida man" stories: Florida man wearing homemade knife necklace charges at neighbors; Florida man cuts neighbor with knife that has "kindness" written on it; Florida woman pulls knife on man after he complained she "farted loudly." Fortunately, no one was seriously injured in these real-life Florida man (and Florida woman) headlines, but they certainly might have you asking, "What's the deal with knife laws in Florida, anyway?" The answer is that they're pretty friendly to knife owners, but go ahead and sharpen up on the legality of Florida knife carry laws before you take a trip down south – just to be sure you don't end up in the next Florida man or Florida woman headline. In the big legal picture, owning and openly carrying most knives is legal for adults in Florida, but a permit is required for the concealed carry of weaponry. "...a person who carries a concealed weapon or electric weapon or device on or about his or her person commits a misdemeanor of the first degree." And, yes, this does apply to knives, whether we're talking about switchblades in Florida, Florida pocket knife laws or butterfly knife laws in Florida – all of these and other types of blades are covered by Florida Statute 790.1. In addition to knives and blades, other types of concealed weapons include dirks, or short daggers; metallic knuckles; billy clubs and similar types of blunt clubs; tear gas guns; and chemical weapons – basically, any type of deadly weapon counts. Any other nonlethal device designed solely for defensive purposes. At the other end of the spectrum, concealed firearms escalate potential charges to the felony level. While concealed carry knife laws in Florida might not sound at all friendly, the southern state's open carry laws tell a whole different story. The law firm of Salazar and Kelly with offices in Kissimmee, Orlando and Altamonte Springs, puts it pretty plainly: Almost all knives are legal to own and carry in the open in Florida. Things go a little deeper, too. Although nonlicensed concealed carry can get you into legal trouble, knives and similar bladed instruments used for work aren't necessarily subject to the same rules. According to Salazar and Kelly's website, it's generally okay to carry something work-related in your pocket or elsewhere on your clothing, like a box cutter or a multi-tool with a blade, especially if the blade in question measures less than 4 inches. In the 2004 case of Holley v. State of Florida, the court found that box cutters and razors did not qualify as deadly weapons because they are designed for utility purposes, rather than for bodily harm. "The right of the people to keep and bear arms in defense of themselves and of the lawful authority of the state shall not be infringed, except that the manner of bearing arms may be regulated by law." Revised or duplicate license fee: $15. Active and retired law enforcement officers and judges are exempt from fees, while consular security officials and out-of-state residents may be subject to higher costs. Licenses are valid for seven years from the date of issuance, and the license must be carried alongside a valid ID at all times when you're in possession of a concealed knife, weapon or firearm. Eligible applicants must be United States citizens or permanent resident aliens, cannot have been committed to a mental institution within the past five years, and cannot have been convicted of a felony or certain controlled substance and domestic violence violations. The Florida Department of Agriculture and Consumer Services may choose to deny the application in the case of those who have committed violent misdemeanor crimes. The department maintains an automated listing of all CWFL license holders in the state, which is available for online viewing at all times upon request to all law enforcement agencies in the state via the Florida Crime Information Center's website. Any place where weapons are prohibited by federal law. Detention facilities such as jails or prisons. Meetings of governing bodies of counties, municipalities, public school districts or special districts. Meetings of state legislature or state legislature committees. Passenger terminals and sterile areas of airports. Places of nuisance such as those where gang activity or prostitution take place – basically, any place that tends to injure the health of a community. Multi-tools that include knives and other blades. Undetectable knives – those that will not set off metal detectors. And just in case you're a Floridian ninja in training, throwing stars are okay to own, too. "Whoever in or affecting interstate commerce, within any Territory or possession of the United States, within Indian country (as defined in section 1151 of title 18), or within the special maritime and territorial jurisdiction of the United States (as defined in section 7 of title 18), knowingly possesses, manufactures, sells, or imports a ballistic knife shall be fined as provided in title 18, or imprisoned not more than ten years, or both." Ballistic knives in Florida may be illegal to own no matter your age, while other knives are fair game, but the state does impose some specific laws regarding minors and knives. In Florida, it's against the law to sell any weapons, including knives, to those under the age of 18 in the absence of a parent or guardian. In fact, adults can't sell, rent, barter, lend or otherwise transfer knives to minors in any capacity at all without the approval of the youth's parents or guardians. Knives aren't alone, either; this law applies to any dangerous weapon. Similarly, it applies to anyone defined as a person of unsound mind, in addition to those under 18 years old. One exception here is that, under Florida law, an "ordinary pocketknife" is allowed for sale to those under 18. As it occurs throughout Florida law, the term ordinary pocketknife goes undefined. That means it's ultimately up to the decision of judges and juries in the state to decide on the line of demarcation between an ordinary pocketknife and other sorts of blades. Based on legal precedents, such as the 2010 case of K.H v. State of Florida, features that may mark a knife as uncommon or extraordinary include double-edged blades, serrations, locking mechanisms, large metal hilt guards and notched or combat-style grips. The 2001 case of Porter v. State of Florida found that a common pocket knife has a blade of less than 4 inches, which is why you'll often hear the 4-inch rule cited. As per Florida Statute 790.1, illegally carrying any type of concealed, deadly knife in Florida can get you slapped with a misdemeanor of the first degree. In the state, a first-degree misdemeanor is punishable by fines of up to $10,000 and jail time of up to one year. Those guilty of selling or otherwise transferring knives to minors without parental permission may also face first-degree misdemeanor charges and the corresponding punishments. 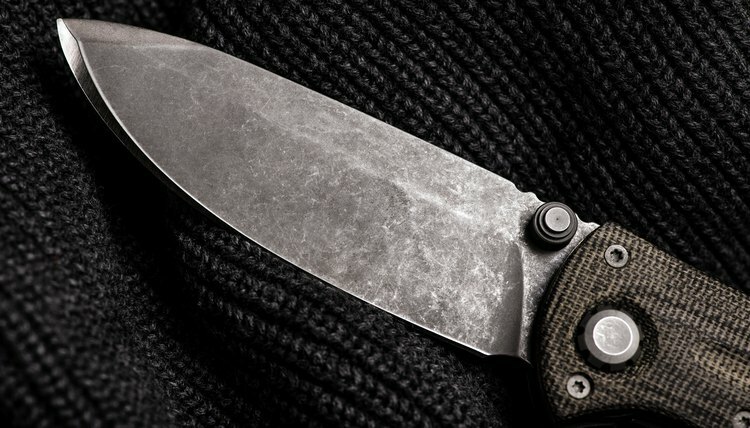 While most casual knife carriers aren't at too much risk in Florida, enthusiasts will find it wise to check in with their local municipalities. Some Florida counties do have bespoke regulations regarding knives and other weapons set out in their unique municipal codes and, in some cases, these rules may differ from state law. News Channel 8: Woman Pulls Knife on Man After He Complained She "Farted Loudly"
Ketchum, Dan. "Knife Laws in Florida." , https://legalbeagle.com/6140502-knife-laws-florida.html. 27 March 2019.